Our vacation villa BWC3301 is a single storey detached three bedroomed, three bathroomed villa with double garage and screened Private Pool backing onto Pond/Lake, with oversized deck to accommodate all the party around the pool with seating & Loungers for eight in the pool area. The pool can be heated when required. Our villa can sleep upto eight people (including children). We have owned our villa from new and is kept to the highest standards which includes us being regular visitors ourselves so we are actively be involved in maintaining and improving it. Its accomodation consists of three bedrooms and three bathrooms (two being en-suites with their own bathrooms). We chose our ville for a its peaceful surroundings and location being just ten minutes from Walt Disney World. Our villa overlooks a lake to the rear and a 45 acre deep water lake to the side so enjoy a high level of privacy with no rear neighbours with just one villa to the side , in addition also have mature shrubs around the pool for an even greater f privacy. Nearby is the large Communal Pool, two floodlit tennis courts, basketball and volleyball courts as well as a BBQ area. The villa consist of: Living / Dinning Room: Formal dinning area with seating for upto six people. large flat screen Cable TV & DVD, Large New sofas giving plenty of seating and tastefully decorated & spacious The villa benefits from Free wireless high speed internet for our guests use and enjoyment. Digital cable tv is installed in every room of the villa for high quality tv for everyone enjoyment, over 100 channels are currently available including Disney, Espn and many more, every room has at least 32"HD flatscreen TV's Kitchen: Breakfast area with seating for four people. Cooker, Fridge/Freezer (with ice maker), plus all the essentials ie Microwave. Also a larder to store food. Laundry Room / Garage: Double Garage. Located in the garage are the Tumble Dryer, Washing Machine, Ironing Board, Iron, Hoover, Gas BBQ. Master bedroom with Queens sized bed and walk in closet, large flat screen Cable TV and storage drawers, Midi hifi with speakers inside and outside. Patio doors leading to pool area and luxury en suite with twin sinks and full size tub and shower. Hairdryer. Bedroom 2 with Queen bed, built in wardrobe, large flat screen tv, draw units with en suite with extra large walk in shower (ideal for disabled users) and a door leading to the pool area. Bedroom 3 with Full sized beds with Twin Bunk, large flat screen TV & DVD player, draw units and a built in wardrobe. 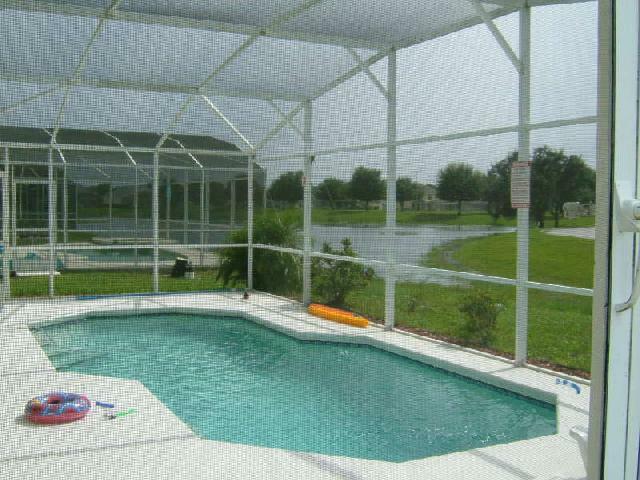 Fully screened with eletric pool heating (Optional at extra cost). Outdoor lighting including pool light. Extended deck with cool decking coating. Large shaded lanai/patio area with table, chairs and loungers. Lake views. Wir haben den Urlaub in dem Haus sehr genossen. Die Community Bridgewater Crossing hat uns sehr gut gefallen. Sehr schöne Lage am See mit vielen Tieren. Auch der Ablauf der Buchung und die Kommunikation mit Floridabestvillas war immer freundlich und unkompliziert. Vielen Dank und Grüße aus Deutschland. We really enjoyed the holiday in the house. The community Bridgewater Crossing was very beautifull. Very nice location at the lake with many animals. Also the process of booking and communicating with Floridabestvillas was always friendly and uncomplicated. We would like to express our thanks and gratitude for having us in your beautiful house , we had a great time and we are looking forward coming back again . Best villas will be always our best chioce . We would like to inform you that we left at 9:30 am July 26th . We followed all the instructions for tidying the house before leaving . We hope that everything was done as required . Thanks again and hope to do bussiness with you again . We had a great stay the home was clean and had everything thing you needed. My daughter loved the pool and the pool toys. Would highly recommend + only a 15 minute drive to restaurants. Tanto la experiencia en el servicio como la casa estuvieron excelente, no tengo queja alguna, al contrario, agradezco todas las atenciones otorgadas y la seriedad en el trato. La casa tiene todas las comodidades y está en excelente estado y ubicación. Sin duda volveriamos a rentar con ustedes, 100% confiable! The place is very good and it has a very nice furniture. However, the only thing that's make it not perfect is the location distance from the major attractions. Es war ein toller Urlaub, wir haben die Zeit sehr genossen und uns in der Villa sehr wohl gefühlt, gerne würden wir wieder kommen :-)! Alles hat gepasst und wir haben uns sehr gut beraten und unterstützt gefühlt, bei Fragen oder Unklarheiten wurde uns von Seiten "floridabestvillas" immer sofort geholfen, wir können diese Dienstleistung nur jedermann weiterempfehlen! Herzlichen Dank für alles! Thank you so much for your hospitality, quite and clean neighborhood with very nice view. All accessories and requirements were available. I did enjoy my stay so much. I look forward to repeat this experience over and over again. Einmal mehr haben wir über FloridaBestVillas die Villa BWC3301 gemietet und eine sehr schöne Zeit gehabt. Das Haus besticht durch seine ruhige und strategisch gute Lage nahe bei Einkaufsgelegenheiten und Sehenswürdigkeiten. In das nicht mehr ganz neue Haus wurde offensichtlich investiert und weitere Renovationsarbeiten stehen an. Bei unserem Eintreffen war der Poolboden und das Wasser im Pool grün. Dieser Missstand wurde nach unserer Meldung umgehend und kompetent behoben, so dass unser Urlaub ungetrübt blieb. wir sind nun weiter gefahren nach Fort Lauderdale. In ihrem Haus war es wunderschön. Wir haben eine tolle Woche verbracht. Wir werden ihr Haus jederzeit weiter empfehlen. 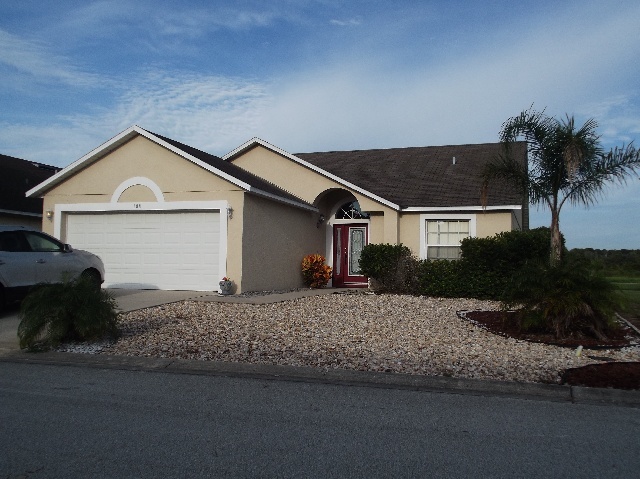 Wir sind erst Ende Oktober aus Florida zurückgekehrt, wo wir nicht zuletzt wegen der Villa BWC3301 einen sehr schönen Urlaub verbringen durften. Bei der Villa handelt es sich um ein sehr schönes und gut eingerichtetes Haus, welches unserer 4-köpfigen Familie Platz im Überfluss bot und in dem auch 6 Personen problemlos Ferien verbringen könnten. Unsere Erwartungen wurden nicht nur erfüllt, sondern deutlich übertoffen, insbesondere was die ruhige Wohnlage sowie die Sauberkeit im Haus und im Poolbereich angeht. Die Bilder im Inserat entsprechen 1:1 der Realität, nur dass für unsere Kinder extra Bettwäsche mit Bildern angezogen wurde, was zusätzlich für Begeisterung und Wohlbefinden gesorgt hat. Auch standen entgegen der uns abgegebenen Information erfreulicherweise gleich 2 Kinderwagen und ein kostenloser Wi-Fi-Anschluss zur Benützung bereit. Zu erwähnen bleibt auch, dass die Villa BWC3301 nur ca. 5 Minuten von 2 verschiedenen Geschäftsvierteln mit Supermärkten entfernt liegt. Zu den von uns besuchten Parks und zum International Airport dauerte die Fahrt auch lediglich ca. 1/2 Stunde. Wir können die Villa BWC3301 nur wärmstens weiterempfehlen und berücksichtigen dieses Objekt bei einem weiteren Florida-Urlaub nach Möglichkeit erneut.